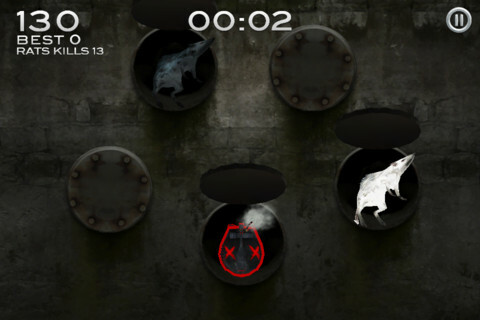 The only good rodent is a dead one in Bethesda's gruesome iPhone title. We've been waiting for Bethesda to throw its hat into the world of iOS development for quite some time, so it was great to see the company finally support the platform, not with a Fallout or Elder Scrolls spin-off (both of which would have been welcomed, by the way), but with a mini-game of sorts for its upcoming console and PC title, Dishonored. Said game is Dishonored: Rat Assassin, a grisly and free-to-play Fruit Ninja clone that tasks you with chopping ugly looking rodents to pieces. That's right. Instead of watching apples, bananas and oranges crowd the screen, different-colored rats appear, and it's your job to slash like mad, transforming the creatures into tasty morsels. In fact, you can slice a rat (by our count) up to four times. Meanwhile, each cut produces a delightful splash of red. What's especially cool about Dishonored: Rat Assassin is the thought that went into it. Yes, it's a promotional vehicle for a much more important game, but Bethesda included quite a bit of content into its free offering without the need for in-app purchase. For starters, there are three separate modes. Challenges throws easy, medium and hard missions at you, each one growing progressively difficult. Assassination, meanwhile, plays more like traditional Fruit Ninja, since you cannot let rats disappear off-screen, nor can you "accidentally" hit the bombs that get in the way. Finally, Timed involves killing as many rats as possible before the clock hits zero. On top of that, you'll unlock both achievements and bonus content the more you play. The extras are quite good, from various backgrounds, to different blades and also music tracks. Bottom line, there's usually something else to play for, aside from your own amusement. Of course, if all you want to do is slaughter rats, go right ahead. Dishonored: Rat Assassin may be a twisted Fruit Ninja clone, but it's a great one, complete with a gruesome edge that sets it apart from other games of this type. You know, the ones that are a bit too cute for their own good. Animal rights lovers will probably recoil in horror, but considering this is fantasy, we encourage you to give those digital rats exactly what they deserve. A quick death. 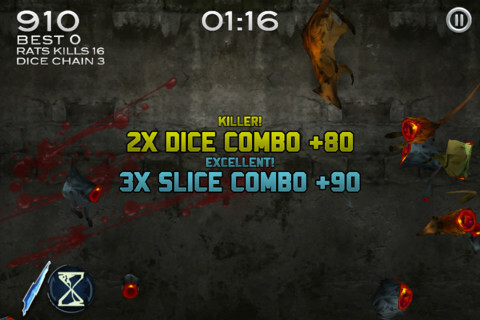 What's Hot: Graphic rat slicing fun, achievements and extras to unlock, responsive touch controls, free-to-play, no in-app purchases. What's Not: No full screen iPad version.